Sorry for this incredibly boring DIY-related post, but here’s a quick piece of valuable advice for anyone who’s having problems with a leaking bath or shower because the seal between the bath or shower tray and the wall isn’t doing its job. 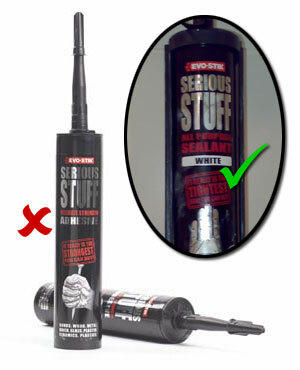 Try using Evo-Stik Serious Stuff All Purpose Sealant (definitely available from B&Q put probably also available at other good DIY stores too). I’ve tried three or four different sealants, including something by Polycell which claimed to be flexible and waterproof. After applying the sealant, it was obvious that it was neither flexible nor waterproof; whenever water made contact, it started to dissolve allowed water to leak through into the kitchen. So far, none have lasted more than one or two days – except for Evo-Stik Serious Stuff All Purpose Sealant. Evo-Stik Serious Stuff All Purpose Sealant is so serious that it comes in a mean-looking black cartridge rather than one of those pathetic white ones. It laughs in the face of water – even when you’re trying to wash it off your hands – and has managed to keep our kitchen dry for days and is showing no signs of dissolving or cracking... yet! Sorted. Job’s a good ’un! I’ve now updated the image and changed all occurrences of Evo-Stik Serious Stuff to say Evo-Stik Serious Stuff All Purpose Sealant. I wouldn’t want anyone to think that I was suggesting you should glue your bath to the wall using Evo-Stik Serious Stuff Adhesive! As a follow-up to my previous post on Google Apps for Your Domain services, it looks like Google are going to add Google Docs & Spreadsheets to their offerings. Furthermore, BusinessWeek suggests that Google might start charging for this service soon. So if you were thinking about using it in the future, I’d recommend you sign up now while it’s still free to beta users. Six years. That’s a long time. Think about what you were doing six years ago. Seems like a long time ago doesn’t it? Well, that’s how long Suzy and I have been going out with each other – and that’s obviously worth celebrating by going out and stuffing ourselves with some top-notch food! Last year, we celebrated five years of togetherness by going to the excellent Supper Club (which has since changed owners but is apparently just as impressive). This year, I booked a table for two at Artisan of Sheffield on Sandygate Road in Crosspool, Sheffield. If you’re from the area, you may know this place as being Thyme Restaurant. We’d both been to Thyme Cafe in Broomhill and thought it was great but had never managed to visit the restaurant. To be honest, I’d forgotten all about it until someone mentioned a few weeks ago that it had changed its name and was actually now known as two restaurants called Artisan and Catch. Catch describes itself as a “Modern & Lively Seafood Cafe” whereas Artisan is a “Bistrot De Lux” – and as much as we both love seafood, we decided to try out Artisan. Artisan has some nice touches. Whilst perusing the menu, you can order some nibbles (like olives or nuts) or even a selection of oysters and a glass of champagne. We did neither and just enjoyed the complimentary bread selection instead, which included an odd one made with treacle. Not really my cup of tea but very nice nevertheless. I don’t know too much about wine, but the wine list seemed pretty impressive and they even offered another list of cellar specials (which I can only assume would have been very expensive). We just settled for a South African Avondale Chenin Blanc. Choosing anything else was tricky; I was totally spoilt for choice. Not being a fussy eater means that you always have a problem when it comes to deciding what to order from a decent menu. I quite literally couldn’t decide which starter I wanted. I had managed to narrow it down to either belly pork or a black and white pudding stack though, so I asked the waiter to recommend one. He said he’d just order one but not tell me which. Fine by me! When it arrived it was the belly pork, cooked perfectly so that it was really melt-in-the-mouth and came with a perfect strip of crackling. Suzy’s mussel soup (served with homemade garlic bread) tasted pretty good too. For main course, I decided to choose something I’d probably never cook for myself; calves liver “bourgonnaise” (at least I think that’s what it said) served with bacon, shallots, some kind of vegetable parcel and mashed potato. Suzy ordered sea bass served with salt and pepper squid, razor clam, chorizo and chickpeas. Both were quite simply excellent. We just about managed to squeeze in a dessert too; Suzy had an almond meringue with gingerbread ice-cream and toffee sauce (and some sort of cinnamon cream we think) and I had a trio of brûlées served with a Bakewell biscuit. Lovely. This “chic restaurant inspired by New York and Paris” – shown here – is really well presented. (And those mirrors hung on the walls above each table at an angle let you have a nosy at what everyone else is eating!) The staff were all incredibly polite and offered a great service. The food was presented in some interesting ways and tasted amazing. The only bad thing? We were sat under a ceiling fan which helped to keep the room a nice temperature but meant my food was a little cold by the time I’d almost finished eating it. And the choice of music was sometimes a bit strange too – unless you think the Blues Brothers in the middle of easy-listening love songs is normal! Anyway, the bill came to £77 for the two of us, which I think is very reasonable for such a good meal at quality establishment like this. Artisan of Sheffield is highly recommended – and I can’t wait to try Catch! On the last Friday before New Year, we got together with a few friends and visited WasabiSabi on London Road, Sheffield for teppanyaki. For those of you who’ve never had the pleasure of going to a teppanyaki restaurant, it’s a Japanese restaurant where you all sit around an iron griddle where your chef cooks your food in front of you while providing some entertainment by juggling, setting things on fire and generally doing crazy things with his utensils! And that’s not a choice of main courses; you each get everything that’s shown! You can download the full menu from their website if you want to see the other options available. I’d definitely recommend trying teppanyaki at WasabiSabi for either a special occassion or any excuse you can think of! It’s probably best to book early as they only have three griddles, go in groups of six of more to fully appreciate the entertainment side of things and be prepared to share your griddle with others.